San Francisco Municipal Railway’s (Muni’s) best of the best cable car operators compete for the title of best bell ringer in the biz. 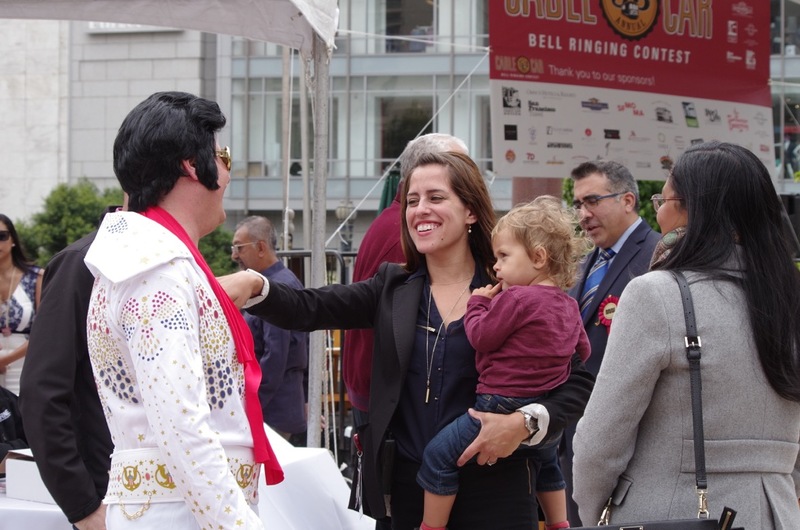 Among the most traditional and highest-profile events hosted by San Francisco Municipal Transportation Agency (SFMTA), I had the honor and challenge of producing the 52nd and 53rd annual bell ringing showdown. This event is pure San Francisco – traditional yet flashy, community-oriented yet featuring local celebrities, offering live music and lunchtime entertainment. And, of course, topped off with an actual cable car parked in the middle of downtown’s Union Square. It’s a feat of logistics that pulls a crowd, generates a flurry of media coverage and reminds everyone of our shared appreciation for the few and the proud San Francisco cable car operators. 52nd Cable Car Bell Ringing Competition on July 9, 2015 in Union Square. R to L: Ed Cobean, Cable Car Sr. Operations Manager, Kristin Smith, Marketing Manager, Byron Cobb, bell ringing champ, Staci Morrison (me! ), Marketing Associate. Community support, merchant sponsorship and cross-divisional agency teamwork is crucial. Outreach to sponsors and local merchants in the Union Square area began as early as the start of the year (the event is in the summer). I was central to outreach, managing a growing list of prospective sponsors, levels of support, in-kind benefits, securing said benefits, organizing donated prizes and overseeing fulfillment of all sponsor perks. I was also responsible for the entire event layout – tenting, seating, audio/visual, staging of cable car, permitting – you name it! Additional to the event logistics, the transit operators and the entire cable car division must be part of and sign off all the plans. After all, the event celebrates them! At the same time, they have important work to do on the rails. I setup weekly meetings with the division superintendent and labor rep to keep everyone talking, sharing ideas and staying up-to-date with the technical, mechanical and aesthetic needs for the big show. The cable car division is notoriously terrific to work with. It’s really no wonder the SFMTA continues this monstrous event year after year. And, on top of the team calls, sponsor outreach and fulfillment, I was marketing lead for all promotional material: printed collateral, digital copy and graphics, on-site signage, handouts for on-street volunteer ambassadors, wayfinding for attendees and participants, and of course, the event script! It’s a bear of an event in the context of public transportation agency. But when in San Francisco, and especially when talkin’ cable cars…this event cannot be too small. Read more about the event lineup, sponsors and contestants on the SFMTA event page at sfmta.com/bellringing. Stay tuned for an update from the 2016 contest coming soon! Greeting “Elvis” one of the amateur ringers at the 53rd Cable Car Bell Ringing Contest on July 7, 2016.